Does one tool work best in every application? A hammer can pound any nail in the house, but a pneumatic nail gun gets the roof shingled faster. 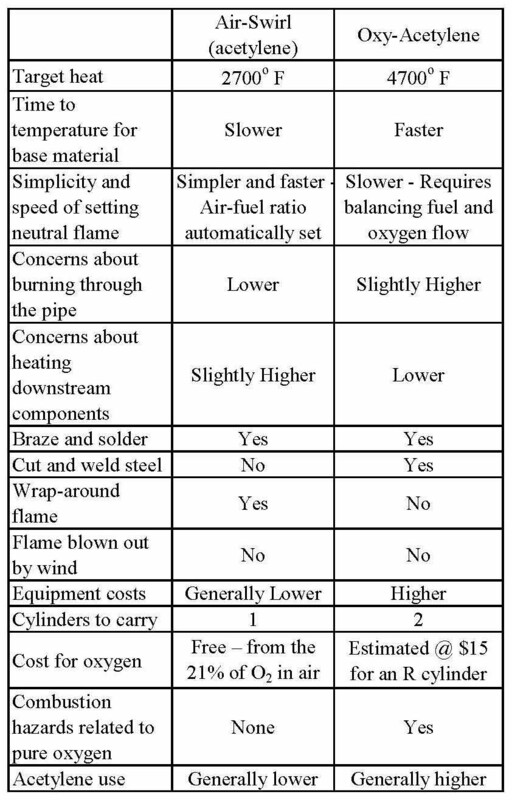 For the HVAC/R or plumbing technician, the right tool for soldering and brazing pipe — an air-fuel or oxy-fuel torch — depends on the type and diameter of the pipe, its location and considerations related to cost, safety, convenience and ease of use. This article will examine those factors, as well as clarify some technical issues. The AWS defines soldering as a joining process that takes place below 840o F and brazing as a similar process that occurs above 840o F. In actual practice for copper systems, most soldering occurs at temperatures of 350to 550o F, while most brazing occurs at 1100 to 1500o F, depending on the temperature requirements of the flux and filler. Clearly, all of the processes can braze and solder. However, more heat isn’t always better, and different processes transfer heat in different manners … and sometimes that’s beneficial and sometimes it’s not. Let’s step back and remember the goal of the joining process: to heat the tube and fitting to a temperature high enough to melt the filler yet remain below the melting point of the base material. Further, the heating process must ensure that capillary attraction (the movement of a liquid along the surface of a solid caused by the attraction of the molecules of the liquid to the molecules of the solid) thoroughly and uniformly distributes the filler material between the pipe and fitting. This means evenly distributing the heat on all sides of the target area. An oxy-acetylene torch with a welding tip concentrates the heat in a comparatively small area, while an oxy-acetylene torch with a multi-flame heating tip (rosebud) applies heat to a larger area. In both cases, the area just beyond the inner blue luminous cones is the hottest portion of the flame. With the temperature of an oxy-acetylene flame more than 3000o F degrees hotter than the 1100 to 1500o F required for brazing, technicians need to hold the torch farther away so as not to melt the base material (copper melts at 1981o F). Also, they must continuously move the torch around the diameter of the pipe to evenly distribute the heat on all sides, as well as to prevent burn through. When it comes to evenly heating a target area, the “wrap around effect” of a air-swirl flame sets the industry standard. With this technology, a removable, cleanable orifice at the base of the torch tip meters a precise amount of pressurized gas to the venturi. The venturi acts like a jet engine, pulling in the exact amount of air through the intakes to create the perfect air/fuel ratio in the mixing chamber (note: the venturi creates a distinctive whistling sound). The pressurized gas then flows through a precision-machined helical rotor, becomes evenly mixed and then ignited in the flametube. The helical rotor’s spiral design also swirls and concentrates the heated gas as it exits the flametube at high velocity. An air-swirl combustion torch provides a hotter flame — the flame can be up to 40% hotter than competitive air-fuel torches. It completely burns the fuel inside the flametube, creating a stable, blow-out resistant flame. The gases coming out of the flametube are pure, clean heat (e.g., a neutral flame). The orifice diameter automatically and precisely meters the fuel gas, delivering 100% pure heat. There is no need to adjust gas flow rates for different tip sizes or for wind and temperature conditions. The high-velocity, clockwise swirling flame has a wrap-around effect with no feather. Higher velocity flames transfer heat better and minimize the cooling effect of the ambient air. Wrapping the flame around all sides of the target promotes better heat transfer, and it makes it easier to heat the far side of the pipe. Better heat transfer to the target decreases labor time and fuel cost. Some websites and HVAC/R training manuals recommend the oxy-fuel process over the air-fuel process simply because oxy-fuel burns hotter. However, some of their advice does not take into account the advantages of air-swirl technology — they still compare oxy-fuel to older air-fuel technology, even though air-swirl has been around for 45 years! The fact is that given two technicians of equal skill, a technician with an air-swirl acetylene torch can beat a technician with an oxy-acetylene torch in a head-to-head competition in many applications. The chart below provides a snapshot comparison of the two processes. The 2700o F air-swirl flame — and the wrap-around effect of the flame — gives technicians more than sufficient heat in most applications. It also provides more forgiveness in lower temperature applications, such as brazing aluminum where the base metal melts at a temperature only 130o F higher than the filler material.The air-acetylene process requires a single tank, so it’s more convenient to transport. Because an air-swirl torch automatically meters the correct gas flow, a technician with such a torch can light the flame and start bringing a joint to temperature before a technician with an oxy-acetylene torch has even set flow rates. Conversely, the higher heat of an oxy-acetylene flame provides benefits in several situations. Chief among these is the ability to braze larger diameter pipe, weld and cut steel and work in ambient conditions that rapidly remove heat from a joint, such as on a cold and windy rooftop. Oxy-acetylene also works well when a joint needs to be brought to temperature as quickly as possible to prevent heat from propagating downstream and affecting other HVAC/R components, such as gaskets inside valves and electronics. In most HVAC/R applications, technicians will find an air-acetylene torch easier, more convenient, safer and less costly to use. If they haven’t used an air-swirl torch kit yet, they owe it to themselves to see the benefits of air-swirl combustion technology. In situations where oxy-acetylene provides the better heating characteristics, by all means, use it and get the job done faster.